How do I login to OUM Digital Library? Recent LMS version does not support Internet Explorer version 7 and lower (IE 6, IE 5 and below). Users are advised to upgrade to the latest version of Internet Explorer or use Mozilla Firefox or Google Chrome. Read here for more information on security flaw exists in Internet Explorer 6. Google will end its support to Internet Explorer 6 starting March 2010. Read here for more information. Please note that popup menu does not appear as intended. Users will not be able to access the Digital Library at this address http://lms.oum.edu.my/modules/main/library.php. This caused by expired EZproxy Session and Cookie. 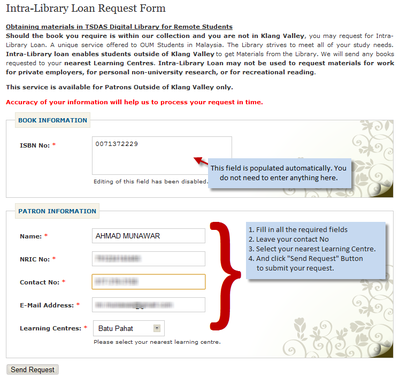 Simply restart your Library Session by re-login into MyLMS and then the Digital Library. Why can’t I get access to the databases? Accessing databases should be freely available whether you are at home, the office or OUM campus. In accessing a subscribed databases, there will always be security involved to prevent hacking or misuse. To secure our own databases, there is a little change in the access link that you will notice on the Library portal. For further details, you may contact En Ahmad Munawar (munawar [at] oum [dot] edu [dot] my / 03-2773 2145). Under Cookies, ensure that Accept cookies from site is ticked. Quit/exit Mozilla Firefox after you change settings and then re-start the application. click on the Advanced button, select Override automatic cookie handling, then select Always allow session cookies. Quit/exit Internet Explorer after you change settings and then re-start the application. Library patrons must come in person and present a valid Open University Malaysia Student Card or Staff Card to check out books. Any book may be recalled after 14 days, regardless of the loan period, if it is requested by an OUM student, staff or faculty member. Overdue fines are charged for RM 0.50 per item per day. Patrons will be billed replacement costs, including a RM25.00 processing fee, for significantly overdue books. Loan Facility is not extended to Tutors, SMEs and facilitators. Do I have to pay fines for late books? Patron will have to resolve all pending payments before continuing to use the loan facilities. I lost/damage a library book. What should I do? The Library charges a replacement fee for lost or damage books according to the price and availability of the book. If the original price of the book is RM100, you are charged for RM200, inclusive of any processing cost incurred. If you decide to replace the book and purchase it at a local bookstore, you are only to be charged the price of the book (RM100). However, you may be charged for a minimal processing fee (up to the Chief Librarian’s discretion). Failure to comply to the rule will effect the release of your graduation certificate. Please contact Suhaimi Jamaludin, Circulation Services (suhaimie [at] oum [dot] edu [dot] my or 603-27732752), if you have any questions about borrowing policies or procedures. How can I become a member of other IPTA/S libraries? All OUM students are allowed to apply for external membership at any local academic libraries such as UPM, UKM, USM, etc. All application for external membership in any of these libraries are strictly under your own responsibilities. The TSDAS Digital Library and OUM will NOT be liable of any matter with regard to this. Each library has its own library policy, procedures and different fee rates. Once you are a member, please respect and abide by their rules and regulation as they would respect ours. External membership means you are allowed to used their library premises and collections ‘freely’. However, some libraries do charge for certain services/collection such as usage of their online databases or borrow books. You may have to get further details on these upon registering for membership at the respective libraries to avoid confusions. Interlibrary Loan is a service through which library materials not owned by the TSDAS Digital Library may be requested and obtained from other libraries, for use by OUM students, faculty, and staff. All currently affiliated Open University Malaysia students, faculty, and staff are eligible to use the service. Tutors and external members are not eligible to use interlibrary loan services at TSDAS Digital Library. They should contact the service at their home institution or at their local public library. Turnaround time for books requested through ILL is typically 2-5 business days. Patrons are allowed to borrow up to 4 books for a period of 1 month. What kinds of materials can Interlibrary Loan provide? Through ILL you may request materials not owned by TSDAS Digital Library. Missing materials (i.e. lost books) may also be requested through ILL.
Books - These can be borrowed, free of charge, in their original form. Theses, reports, unpublished materials — Not borrowable. You will be notified by e-mail/phone as soon as the material is received. Please refer to this post on & Articles from other Libraries">How to get materials from other Libraries or if you can use this form to request immediately. I got a recall notice. What is that? Recalls (or request) are a way for the library to ensure that all borrowers have equal access to its print resources. If a book you need is checked out, you may recall it from the current borrower , who will have 3 days to finish with it and return it. Conversely, if someone needs a book you have checked out, they may recall it from you, and you will receive a notice letting you know that you must return the book within 3 days. Look for My Library Card link under User Links Block on the left side bar. Please click that link to open Patron Circulation Information page. You should be able to see the list of currently checked-out item and check boxes for renewable item. Check the boxes of titles to be renewed. Click on Renew Selected Items. Renewal can be made only ONCE for additional period allocated to borrower category. Renewal can be made 7 days before the due date. If the book is overdue, you need to return it at the Library. You are not allowed to renew if the book has been recalled by another user. How do I suggest a book for the collection? What electronic resources are available to me? The Library subscribes to a number of databases to help you with your research. They cover all subjects taught at the University. The databases provide full-text books, journal articles, theses, reports, newspapers. etc. Each database provide Help guides for better searching. These databases are accessible from anywhere at anytime. No extra username/password needed after you login from LMS. Is there more than one catalogue? There are several types of materials in the Library; printed, electronic and audio-video (cd-roms, kit, tapes). To search for printed and audio-video materials, you need to use the OPAC. 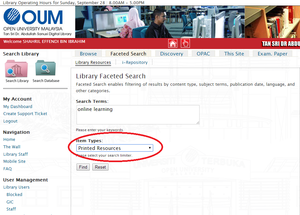 To learn how to use OPAC, click the Portal user Guide and go through content. Printed materials are only readable and usable offline. Which means, you need to come to the Library and use them. You may borrow the printed materials (books). Audio-video materials are only to be used in the Library. 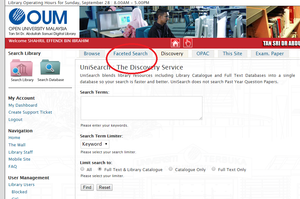 To search for electronic materials, you may use the Library UniSearch Discovery Service. UniSearch blends library resources including Library Catalogue and Full Text Databases into a single database so your search is faster and better. Or you can use the Library Databases to search for books, journals, theses, reports, etc. You may access these databases through the Library portal from home or anywhere else, at anytime. You can also download, print or save the materials. How can I find material in the Library? Use the Library catalogues. Check OPAC: the online catalogue, first. It is accessible from both on and off-campus, and contains all printed materials most material likely to be on student reading lists (if held by the Library). A search in OPAC will tell you which materials are available in print or electronic format. 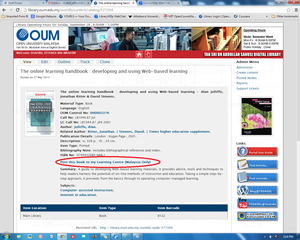 It will also tells you where the book is located in the Library system, either in the Main Campus Library or at the Resource Centres in any of the Learning Centre. The system will also tells you the status of the book, whether it has been loaned out or still available in the Library. If you need to find electronic books, then you can use our Online Databases. 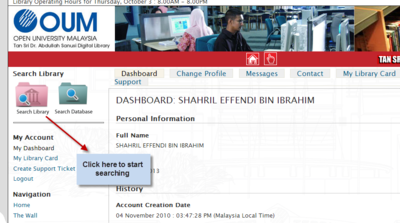 Go to the Library portal and click Online Databases under Search Library. Choose the right database for the subjects you are looking for. Click on the database name to know the subject coverage. Guides are made available for all databases. Please refer to Portal User Guide for more information. 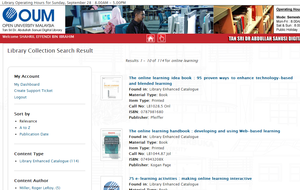 The Library Catalogue will tell you if the item has been borrowed or available. If it’s not on loan and not where it should be on the shelves, it might be on the trolleys (to be re-shelved) or being used by others in the Library. If you still can’t find it, ask at the Librarian on Duty at Information Desk for help. Also, you need to check on what you type in the search box and how you type it. Errors in searching will display no records in the system (same goes with searching in the online databases). Where can I get the exam papers? As a repository centre, the Library collects and keeps past year question papers for reference. 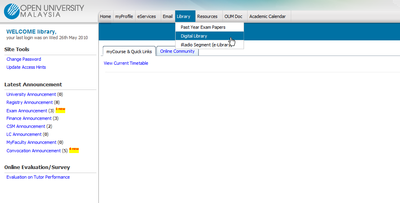 Students may access the papers from the Library portal using the Search Library button on the left side-bar. 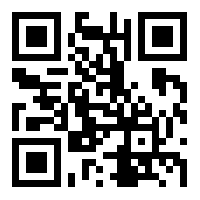 You can search the papers using the course code. However the availability of past year question papers is governed by policy imposed by Examination Unit. All Examination Papers for Undergraduates are from the last 4 semesters only. The Library does not keep any answer scripts or answer schemes. MCQ based Examination Papers will not be made available. The Library will use to this operating hours unless mentioned otherwise by the Management. * Use the LC Director’s/Administrator’s line with regard to resource centres at the OUM Learning Centres. Below is a map for directions to the OUM Main Campus via public transportation and car. If you’re an OUM student, please report any lost cards to the Learner Service Centre (LSC). LSC can be contacted at 1-300-887-300, or facsimile at 03-2697 8853. The service hour is from 8.30 am to 5.30 pm, Monday through Thursday, and 8.30 am to 5.15 pm on Friday. I left something in the library. Is there a lost and found? The Digital Library does not have lost and found unit. However, when found, we will keep them in our office. If you left something library, please contact us at 603-2773-2135. If you left something in the resource centre, please contact the appropriate Administrator. The TSDAS Digital Library at the OUM Main Campus has a cluster of about 30 PCs and students are welcome to use for searching OPAC, online databases and the Internet, using e-mail, word-processing, spreadsheets, etc. They are not bookable. If you need any assistance or help with finding information and using the Library’s online databases, you may ask the Library staff. You may also use your laptop and connect to the Internet through the WiFi connection available. The Resource Centre at the LCs are also equipped with several PCs and Internet connection. How do I print or make photocopy in the library? A printer/photocopying machine is available for paid printing/photocpying in the Library. The Library only offer black and white printing/photocopying at 10 sen per page. Please see the Librarian on duty if you need to print/photocopy. Where should I use my handphone in the library? In order to provide an environment conducive to using the Library, please conduct handphone conversations away from study, research, and service areas; and turn off ringers while in the Library. Since all areas are close to each other, usage of handphones are only allowed OUTSIDE the Library. Where can I find a pay phone in the library/campus? No pay phone is available in the Library or on campus. The library does not provide a fax machine for use by patrons. Where can I get modules in Bahasa Malaysia? Every semester, all modules are edited and updated by the SME to keep the information abreast. Every semester also, the Library will receive these new modules for ’safekeeping’. As a repository centre, the TSDAS Digital Library keeps all printed modules for archival purposes. Students are allowed to use only the current semester’s modules but not the previous modules. Which means, if the current semester is September 2008, only modules published/produced in September 2008 are allowed to be referred by students. This also means that previous modules in BM are no longer made available for reference. Please follow these steps to get modules in PDF from myVLE. All modules are available in Printable Version. However, some modules may not available in PDF. 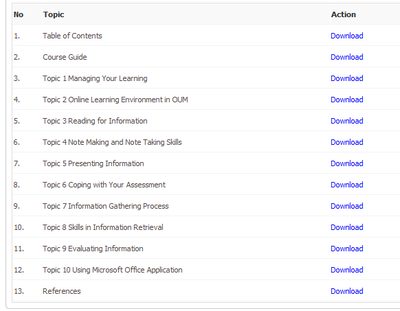 myVLE team is trying their best to make each modules available in PDF. Click on that link to view the downloadable chapters of that module. Select any chapter to download as PDF.